The link to register for DU admission has been activated on the official website; www.du.ac.in or on www.du.ac.in/ug-ad.html#. 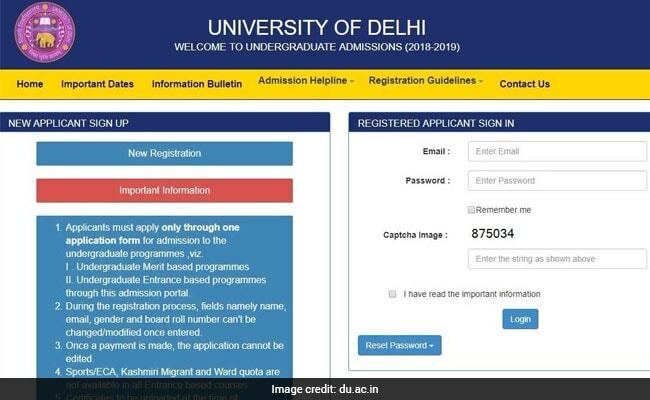 New Delhi: The online registration process for admission to more than 50,000 undergraduate (UG) courses in colleges affiliated with Delhi University (DU) or University of Delhi began today on the official website. The online registration process will be held till June 7. The link to register for DU admission has been activated on the official website; www.du.ac.in or on www.du.ac.in/ug-ad.html#. According to the University, UG Admission Portal is mobile/tab friendly. However, it said that the webpage may appear different on different devices. The instructions given below are for the webpage as it appears on a desktop/laptop. Step Two: The applicant may go to "New Applicant Sign Up" to create the user account by clicking on the "New Registration" link. Applicant then must enter all the required details. Then save the details. Step Three: Once registered, the applicant can now log on to the UG admission portal to complete the online registration form with their Personal, Academic and Bank details. In this step, the students who are planning to apply for admission in Delhi University have to enter details in Nine sections depending on their interests in courses and quotas. In the third section/page, the applicant can select any number of Merit-Based courses (where admission is based on merit) based on applicant's eligibility. In the fourth section/page, the applicant can select any number of Entrance-Based courses(where admission is based on entrance) based on applicant's eligibility. In the fifth (Sports) section/page, an applicant can select "Yes" for consideration of admission through Sports Quota. In the sixth (ECA Quota) section/page, the applicant can select "Yes" for consideration of admission through ECA quota. In the seventh (Uploads) section/page, the applicant has to upload required documents. In the eighth section/page applicant can preview the completed application. In the ninth section/page, applicant can proceed to the online registration payment Applicant's online registration process shall be completed only after payment and realization of the online registration fee. An applicant can update information in the application form by revisiting applicant's account till the last date of registration but before the payment of the online registration fee. The changes can be saved by clicking the "submit" button at the end of each page. The online application will become uneditable after the payment is made. No request or a grievance shall be entertained to make change amendments in the online application after the payment is made. In case the applicant has forgotten the password or wishes to reset it, the applicant can do so by clicking "Reset Password" button. The applicant can reset the password in two different ways for which the links are provided in the drop-down menu.